One of our favorite things to do during our German honeymoon 10 years ago was to try local specialties in each city: Kölsch beer in Cologne (Köln), lebkuchen in Nuremberg, schneeballen in Rothenburg, and brezels in Munich. Currywurst is certainly a memorable local specialty, a favorite of Berliners for over 60 years. It’s simply a German sausage topped with tomato-based curry sauce, and they sell tens of millions of these in Berlin every year. The popularity of the dish spread throughout the city and now there are currywurst stands everywhere and even a currywurst museum that opened in 2009. Apparently this is fast food that anyone can learn to love, even if the combination doesn’t sound quite appetizing at first. The story goes that a certain enterprising Berlin housewife traded some alcohol for curry powder from British troops in the time after World War II when the city was still in ruins, and she began selling sausages topped with a spicy tomato-based sauce to local construction workers in 1949. The price was right and the spicy dish sold fast. There is no such thing as a definitive currywurst recipe because it’s different all over the city, and the locals are passionate about the subject. If you want to start a casual conversation with a Berliner and don’t know what to say, ask about their favorite currywurst stand. Sausages might be fried or grilled, with casing or without, and the variations on the curry sauce are limitless. You could theoretically visit every single currywurst stand in the city and taste a different dish every time. Our recipe is simple, relying on the curry powder and sautéed onions for flavor. 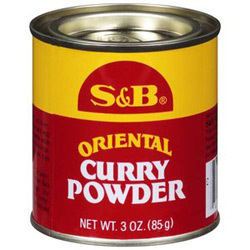 I am particularly fond of S & B Curry Powder, which seems to have a bit more punch than other brands, and you can find it in most Asian grocery stores or online. The amount of curry powder can vary depending on how much spice you like. Makes about 2 cups of sauce, serves 8. 1. Warm the oil in the saucepan over medium heat and sauté the onions until they are soft. Add the curry powder and stir until the powder absorbs the oil and the heat releases the fragrance. 2. Add the tomato sauce and sugar and stir. Continue cooking at a simmer until the sauce is heated through. 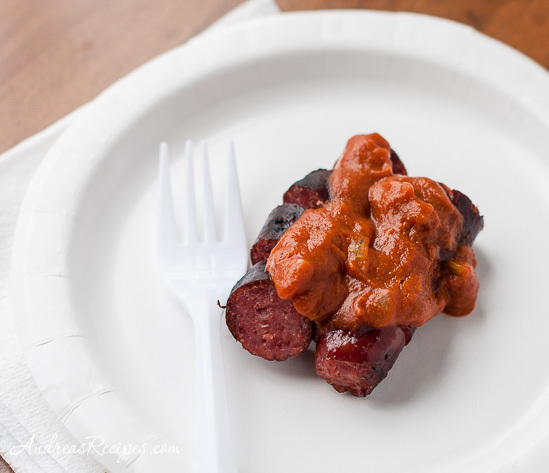 Spoon over the sliced bratwursts, sprinkle on some more curry powder if you like, and serve hot.